As a city dweller, my backyard consists of a large slab of concrete. Luckily I don’t need a lush lawn to put together a well-composed container herb garden and have fresh herbs at my fingertips all summer long, perfect for sprinkling in salads and pastas. For a herb garden with no fuss, all you need is a few pots and a place in the sun. This year, I’m starting off my herb garden with: purple basil, mint, cilantro, parsley and lemon thyme. 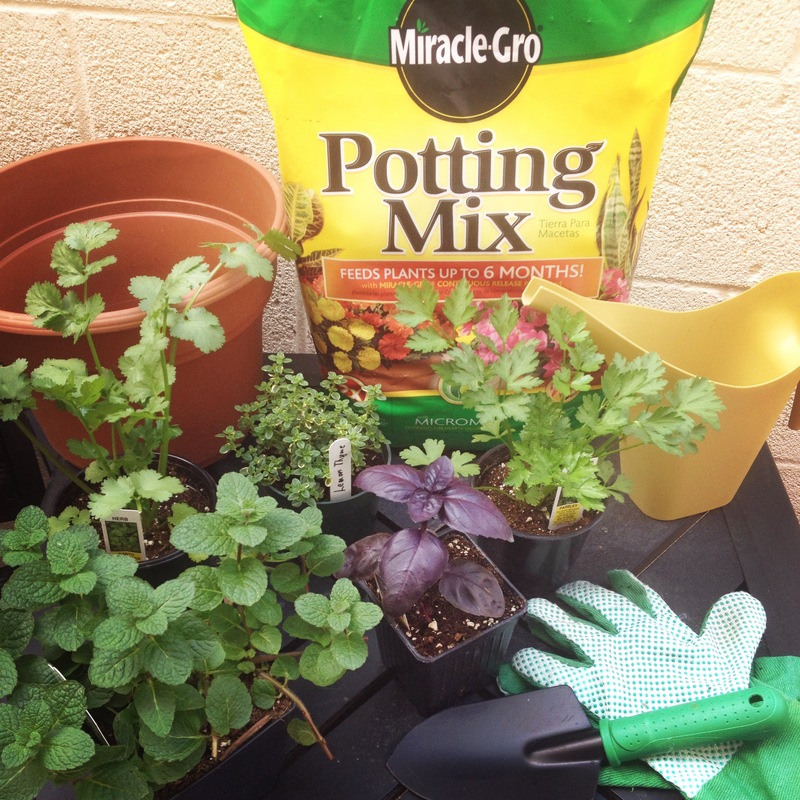 Before I get to potting my herbs, I did a little reading on what and how to plant. If you haven’t planted your herbs yet, here are a few interesting facts from Better Homes & Gardens about the best herbs for container gardens. 1. Basil, a beloved Italian annual herb, grows best in full sun and fertile, moist soil. Once the root system is established, about six weeks after sowing, it tolerates short periods of drought. Basil is a good companion with parsley, thyme, and other herbs when grown in a pot that holds at least 5 gallons of soil. 2. Chives are grassy, clump-forming perennials with hollow leaves. Essentially tiny onions, chives are grown for their leaves and blooms rather than their bulbs. Their fragrant pink-purple spring flowers are also edible. Plant them in well-drained potting soil that’s rich with organic matter. They can tolerate light shade but do best in full sun. Chives grow well in container gardens. 3. Cilantro, also known as coriander, can be used for its tangy leaves or its dried, ground seeds. Plant this annual herb in well-drained soil. Cilantro grows best in sun, although it tolerates some shade. Because it has a long taproot, place it in a container garden that is at least 12 inches deep. 4. Tarragon is a classic French herb used to season fish and many other foods. Its name is derived from the French word for little dragon, referring to the herb’s bold flavor. Plant it in full sun and well-drained potting mix. It tolerates drought well and should not be overwatered. Tarragon grows in partial shade but does best in full sun. 5. Lavender is a bushy perennial shrub that does best in full sun and well-drained potting mix. Keep it on the dry side and avoid fertilizer. Lavender hardiness depends on the variety. 6. Lemon balm, an old-fashioned favorite that spreads freely and self-sows readily, is perfect for container gardens so it doesn’t take over the yard. Plant in partial shade or full sun and in moist, rich, well-drained potting mix. 7. Lemon verbena is a tropical shrub that’s commonly grown as an annual in container gardens. Plant nursery-grown plants in pots filled with well-drained potting mix. Avoid fertilizer; lemon verbena grows best with few nutrients. It prefers full sun. 8. Marjoram, an oregano relative, has a sweeter, milder flavor and aroma than its cousin. Grow it in full sun and well-drained potting mix. 9. Mint is such a vigorous plant that it will become invasive unless it is confined in a pot. Grow it in full sun or partial shade. Mint can grow in many soil types and degrees of sunlight, but it produces the best leaves in rich soil. 10. Oregano is an essential ingredient in Mediterranean cuisines. The plant is a shrubby perennial that does best in full sun and well-drained potting mix. The more sun oregano receives, the more pungent the flavor of the leaves. 11. Rosemary, a Mediterranean evergreen shrub, likes hot, dry, sunny spots. Quick-draining soil is the key to good growth. It’s drought-tolerant. Keep the soil moist but never wet when grown indoors. 12. Sage is a favorite for seasoning poultry. Best grown in full sun and moist, well-drained potting mix, sage is perfect for adding structure to container gardens. 13. Thyme comes in many varieties, but all grow best in full sun and well-drained soil. Thyme does not tolerate wet soil, so avoid over-watering. If you have a green thumb, what tips or tricks have you learned? I love sweet basil, and have never used purple basil. How does it differ? I love herbs too, and can’t wait for them to get growing! I love sweet basil too! I’ve never planted purple basil myself, only ever enjoyed it at restaurants. It’s not as sweet and has a slightly spicy flavor.